This tool calculates motor overload protection rating and maximum horsepower of a motor for given Service Factor and horsepower found on motor's nameplate. The calculations of this tool are based on Article 430.32 of National Electric Code (NEC, 2011 version). Overload protection is required to protect motors against damages or dangerous overheating that may start a fire. 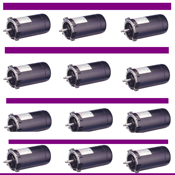 Overload protection rating must be done as per motor's nameplate full-load rating. It should NOT be done as per FLA rating which is calculated as per HP and voltage using the tables provided in Section 430 of NEC. Overload protection devices should be rated no more than the overload protection rating calculated with this tool. The maximum horse power calculated with this tool depends on Service Factor. Maximum horsepower is the permissible horsepower loading of a motor, which is more than nominal horsepower, provided that voltage and frequency values given on nameplates are maintained.